zrozumienie Feng Shui Wędrujących Gwiazd. którymi w obecnych czasach najczęściej mamy do czynienia. przykładów, które w miarę czasu wspólnie przeanalizujemy i omówimy). najwspanialszych rynków miejskich w Europie. Szczegółowe informacje i zapisy na zajęcia: biuro@fengshui.biz.pl , tel. 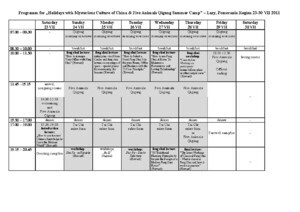 May 22-24 (Sun-Tue): "Xuan Kong Day Selection (2 days) and advanced workshop on Fei Xing (1-day, case studies)"
June 21-26 (Thu-Tue) Feng Shui/Calligraphy/Qigong Summer Camp: "Holidays with Mysterious Culture of China"
3-5 Three-days workshop: Feixing practices and advanced aspects for students who have completed the PPC and for those who have not attended Unit 4 or 5 yet. We have to solve Qigong with Andrzej Szuszkiewicz (AS): he prefers weekends, so maybe to use Saturday and Sunday (6 nad 7th) nights: we will run FS workshop from 9 a.m. to 5 p.m. and qigong could be from 6 p.m. to 9 p.m. which gives 6 hours in total (time AS asked for). Beginning from next workshop (May) Sundays are free so there will not be problem with AS qigong classes. Sunday May 23, Qigong with AS. July 12 organizers arrival, July 13-23 Summer Camp (10 overnights), July 24 departure. July 13-18 (5 days) Qigong camp, invite all AS students to attend (part of the 5 sessions in 2010 to cover the full Five Animal Frolic set), as well as students from the Krakow evening classes. July 18-23 (5 days) FS and Mysterious Culture of China. China Tour September 17 – October 01, 2010. 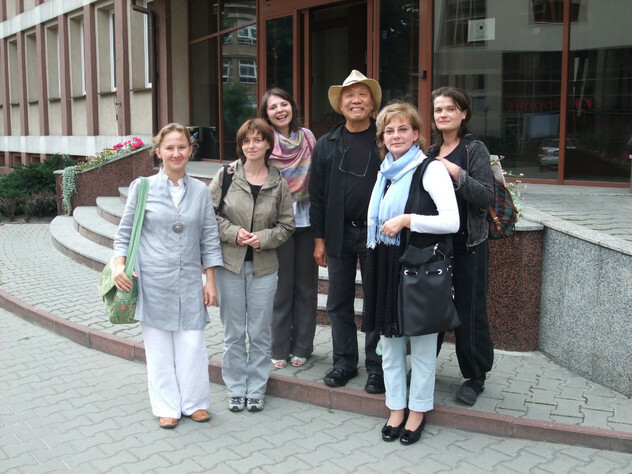 Taiji Camp in Herzfelde with Piotr Ziemba: July 25-31, 2010.